There’s nothing like having to design for real curves to send our designers for a real loop. Some of the nine remaining designers were really sweating it this week and the workout clothes Heidi Klum for New Balance episode was three challenges ago. ;) Boobie talk made so many of our boy designers scratch their heads and showed us that the all knowing Tim Gunn actually has limits, but even more adorable than ever! ;) So now, ‘What Would Project Runway Shoe?” (#WWPRS) is a little ditty I do about pairing a shoe or two with the winning look of the week. SPOILER ALERT! Stop reading if you want to wait and watch the episode first reading about the winning design. Well this gives Mz. Joshua (#PR9joshuam), his second win this season. And I really did love the fantastic and fun, Kate Spade like little black dress he made. Classic lines that you could wear to many fun Working Girl type events. :) I did love the pop of fun turquoise in the shoe he picked which looked like a Pour La Victoria pump. 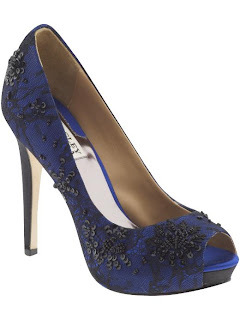 However, I would have taken it up an elegant notch with the Badgely Mischka ‘Stella’ in this divine Royal Blue. The lace overlay and sequined flowers add the bedazzle that Joshua was DYING to add to it. ;) When a gal is going out, she wants to sparkle. And ‘Stella’ doesn’t disappoint. Now I know that the tradition of “What Would Project Runway Shoe?” is to pair a shoe with the winning look, but I feel that Viktor was robbed…. And that may be the Working Girl style in me talking now. Regardless, I’m going to make an exception and pair a shoe with Viktor’s (#PR9viktor), DE-VINE design that I truly adored. This outfit deserves to be in EVERY Working Girl’s closet. And as such, the Charles David ‘Dimora’ must be too! While I understand the neutral choice Viktor went with, I prefer the nice contrast of the deep red, burgundy color of this heel. The burgundy color fits in the jewel tones color palette of the look. This outfit also has that Kade Spade feel, which we adore. And to me, having that mary jane strap makes me feel like it’s a perfect complement to the classic era. The peep toe is just a flirty touch to give the overall look enough sass to make you feel like the queen of the cubicles. !! !WORKING GIRL’S SHOE CLOSET ALERT!!! Upcoming MAY JOR giveway coming up! To be IN on the WIN, you must 1- Follow the Working Girl's Shoe Closet blog, 2- Like my Facebook Page, 3- Follow on Twitter, and 4- Retweet! @Shoe-radar.com Thanks Doll... Do you think Viktor got robbed?